Anaheim, California  The Why We Worship series presents Kingdom topics and Vineyard values through intimate and powerful worship. 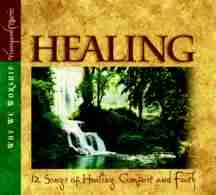 The fourth release in this popular series is entitled Healing. Featured on this release are 12 worship songs that convey comfort, peace and encouragement to those needing emotional, spiritual or physical healing. Rita Springer, Laurie Adams-Klein and Michael Hansen combine their unique leading styles and songwriting abilities to create a powerful worship set. Featuring many Vineyard classics, as well as new recently used songs within the church, the themes range from intimate personal healing, to cries for God's healing restoration of the nations. Healing is tenderly and beautifully recorded, and will be a welcome addition to any believers worship collection. Most importantly though, it will help Christians to focus on the only true source of healing  the Lord Jesus! Also included within the package is a brief written teaching on the subject of healing by the late John Wimber. Songs Include: Arise Oh Lord, Come Walk Among Us, My Soul Finds Rest, Simple Prayer, Learning To Rest, On And On, Too Deep For Words, Mend A Broken Heart, Heal Us Now, Faithful Love, Father, I Want You To Hold Me, Let Your Healing Love.